Since 9-11 our lives have changed. One of the positive aspects to come out of this tragedy is the spirit of our nation. Our greatest generation experienced this during WWII…rationing, being prepared and the willingness to serve within the community. "Neighbors helping Neighbors"In the summer of 2006 we experienced a massive electrical power outage that affected 55 million people throughout the Northeast. Nation-wide, there were no riots, looting or increase in crime. Instead, people came together to provide care, comfort and compassion for their neighbor. After recent events, such as Hurricane Katrina, we learned that recovery from a disaster, whether it's manmade or an act of nature begins within each community.Our community continues to prepare for such emergencies: planning, training and evaluating in order to respond to any incident in a quick and efficient manner. County-wide, cities are forming CERT teams (Community Emergency Response Team). These teams can be put into action quickly, already trained in the basics of disaster mitigation. Cuyahoga County Citizen Corps, which includes that county’s CERT Teams is one of 4 finalist to be recognized for a National Award. Volunteers will be the key to success. Volunteers are everyday people, of all ages*, interests, backgrounds and skills. Only with YOUR help as a Volunteer can we continue to grow and serve our community by having Citizen Emergency Response Team in place ready to help in an emergency. 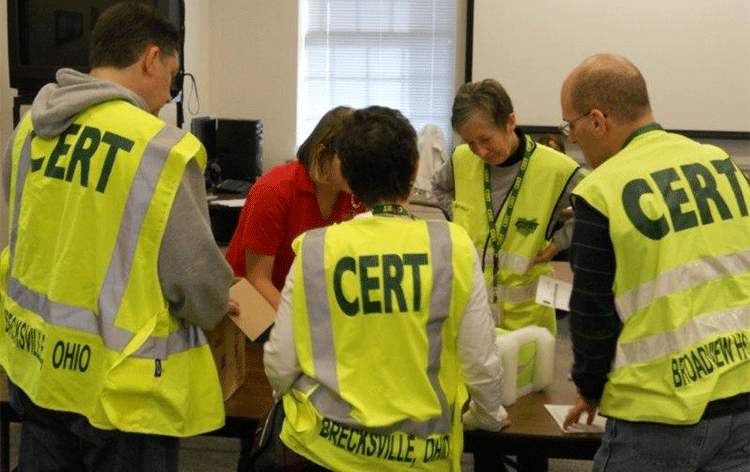 If you have any questions concerning CERT (Citizen Emergency Response Team), please call the Brecksville Fire Department at (440)526-2640. You can also contact us by email at cert@brecksville.oh.us. *Volunteers must be at least 14 years old. Those under 18 must have parent approval or be accompanied by an adult. Meetings are once a month at 7 PM in the Brecksville Human Services Building (1 Community Drive).